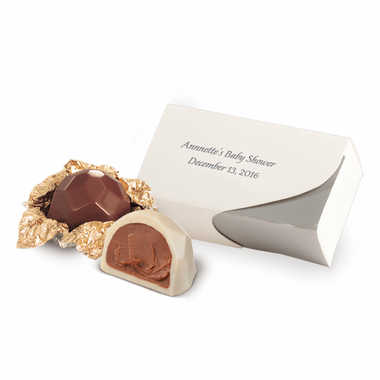 The most popular give-away for men and women is chocolate truffle favors. 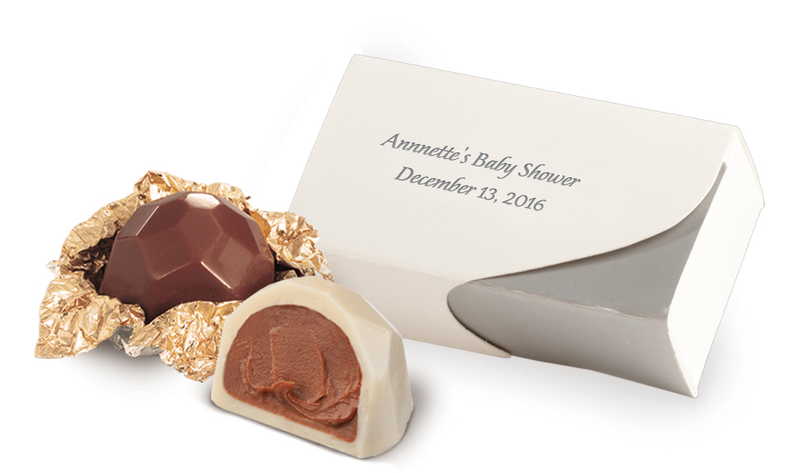 They can be enjoyed for any occasion and personalized with the guest(s) of honor's name and event date on the box. Each box contains two chocolate truffles, one milk chocolate hazelnut truffle wrapped in gold foil and the other Belgian white chocolate truffle with silver foil. The box is offered with your choice of box accent color and imprint color. The box dimensions are 2.5"W x 1 1/3"H and the imprint area on the top is 2 1/8"W x 1"H.
PLEASE BE ADVISED THAT SHIPPING DURING WARM WEATHER MAY REQUIRE A SHIPPING UPGRADE AT ADDITIONAL COST DEPENDING ON YOUR LOCATION AND THE TIME OF YEAR YOU ARE ORDERING. WE WILL SEND AN EMAIL TO YOU WITH SPECIFICS REQUIRED TO PROCESS YOUR ORDER. PLEASE MAKE SURE THAT THE PACKAGE IS SHIPPED TO A LOCATION WHERE SOMEONE IS PHYSICALLY PRESENT AT ALL TIMES TO TAKE DELIVERY. WE ARE NOT RESPONSIBLE FOR MELTED CHOCOLATES THAT ARE LEFT EXPOSED TO ELEMENTS UPON DELIVERY.